Ian Wilkes hasn’t lost faith. He still believes that when the dust storm that is this year’s 3-year-old male division clears, Janis Whitham’s homebred McCraken will convince the masses of his talents. There will be several statements that need to be made between now and season’s end, but the first step toward what McCraken’s connections hope will be a second-half resurgence went exactly in the manner they would have scripted. The McCraken that inspires such confidence from Wilkes is the one that showed up in the June 17 Matt Winn Stakes (G3) at Churchill Downs, where he unleashed his typical kick after he ranged up on the final turn en route to a 2 1/4-length win in his first outing since an eighth-place finish in the Kentucky Derby Presented by Yum! Brands (G1). There is inherent pressure to deliver any time a trainer saddles a 1-5 favorite in a field. Given the level of expectations McCraken has carried for much of his career, Wilkes just wanted to see the version of the bay colt that was widely regarded as one of the leaders of the sophomore ranks. 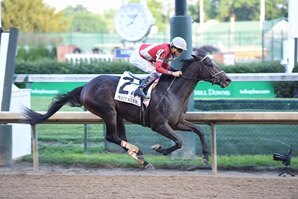 Prior to his disappointing Kentucky Derby outing, McCraken suffered his first loss when he hit the wire third in the April 8 Toyota Blue Grass Stakes (G2) at Keeneland. On Saturday night, after getting away a bit awkwardly out of post 2 in the 1 1/16-miles Matt Winn, he looked like the stalwart who was unbeaten in his first four outings, as he tracked along fifth in the six-horse field before accelerating on cue when nudged by jockey Brian Hernandez Jr. around the final turn. Wilkes’ spirits were lifted early in the Matt Winn as he watched his charge lope along in a relaxed manner, while Aquamarine under jockey Florent Geroux carved out fractions of :23.58 and :47.48 through a half-mile with Mo’s Mojo about a length off in second. When Aquamarine gave it up in the final quarter and dropped back on the rail, McCraken was clear in the four-wide path and moving with confidence under Hernandez. It became a battle for second a handful of strides later, as McCraken opened a two-length advantage under left-handed urging and stopped the teletimer in 1:42.84 on a fast track for his fourth win in five starts at Churchill. “His last couple races, in the Derby and even in the Blue Grass, he left a little on his toes and today he was kind of back to his old self, where he got into a nice rhythm around there and wasn’t wanting to overdo it in the first part,” Hernandez said. “Then he kind of just built his confidence up as he went along and he went on by those horses pretty easily. You always hear it, but it really was the perfect race for a horse coming back. Colonelsdarktemper ran on to get second by three-quarters of a length over Society Beau,with Mo’s Mojo, Excitations, and Aquamarine rounding out the order of finish. Out of the Seeking the Gold mare Ivory Empress, McCraken paid $2:40, $2.10, and $2.10 across the board. He improved his record to five wins from seven starts and has $472,228 in earnings. Wilkes was non-committal on where McCraken might start next, citing his usual “one-day-at-time” mantra. What he saw Saturday confirmed to him that the horse who captured the Sam F. Davis Stakes (G3) in then-track-record fashion during his seasonal debut hasn’t lost his ability to inspire some lofty thoughts.